Viz's latest shoujo fix comes in the bright, plucky form of B. B. Explosion, the first title available in English from Yasue Imai. This is a rising star series, akin to Chance Pop Session and Forbidden Dance, wherein young Airi Ishikawa discovers she has an unexpected talent for singing and dancing. Airi had long idolized the various pop singers she saw on Boom Boom, a TV program showcasing hot new talents in the music industry. However, she's from Okinawa, and thus is a bit removed from the glamour of Tokyo. Luckily for her, an astute judge at a local dancing audition has placed Airi on the fast track to fame, but is she ready to endure the consequences of stardom? B. B. Explosion is shoujo at its most extreme. Everything in the series is cute and energetic, and there's even a little magical mascot named Cesar, visible only to those who have the potential for celebrity. Cesar, much like Kero-chan in Cardcaptor Sakura, behaves as Airi's conscience, though his ability to enforce his own advice is limited. In all seriousness, in only the first volume of the series, the standard sensitive subjects that should be found in all coming of age stories are covered. First of all, Airi's father doesn't want her leaving Okinawa for Tokyo, and so she must choose between her newfound dream and obeying her dad, which is always a tough decision in this sort of tale. Airi's skillful audition landed her a chance to attend Actors, a renowned school for the performing arts. Once there, she quickly realizes that it takes more than raw talent and enthusiasm to become a star. She must be willing to work hard to make it as a pop star, and her first few weeks at Actors will most likely determine her chances of sticking to her path in the long run. I have to stick this title up with my other girly guilty pleasure, Forbidden Dance, because it's a good, simple, endearing tale that helps scare away the bad things that occur during the day. 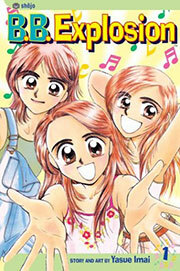 The artwork is very pretty, with standard shoujo screentone techniques, shiny hair, and exaggeratedly large eyes and mouths. The book is unflipped, and the adaptation reads smoothly. With a release like this, I always worry that too much goofy American slang will get thrown into the English adaptation, but altogether this series has undergone a rather smooth transition as far as I can tell. If you're not into shoujo, or if you prefer shoujo that focuses more on romance and less on the pop music industry, then you may be tempted to pass on B. B. Explosion. However, if you're looking for some light reading with a good cast of characters, solid artwork, and a plucky heroine, then this might be a good title to pick up. It may not inspire you to quit your day job and audition for American Idol, but perhaps it will help take the edge off of a long day. At times, I don't think I really need anything more than just that.